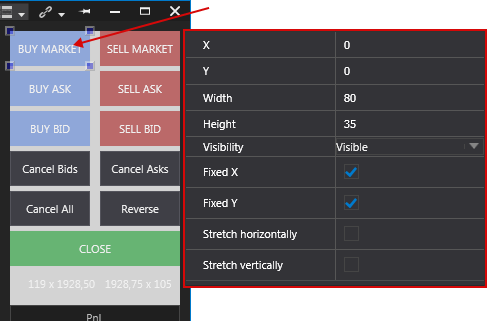 Right-click on the Chart Trader panel. Select Settings in the context menu that opens. This will open the Configuration window to the left on the chart. 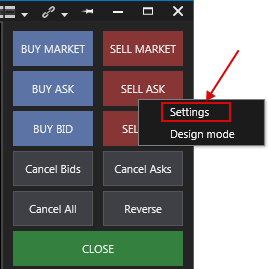 Design mode - this mode allows customizing the Chart Trader look: the size of buttons and the location of buttons. To activate the editing mode, follow the above steps. - In the window that opens, configure the button to your preference. You can set button size and location, fix the button's position or extend the button. After all the settings, use the Visible function to display the button on the module; hide unnecessary buttons by selecting Hidden.